When I was a kid, we had a plastic birdbath in our backyard and I loved watching the birds splash around. Plastic birdbath in my yard – horrors! No, only unique bird baths will do. Make one out of an old step ladder of course. 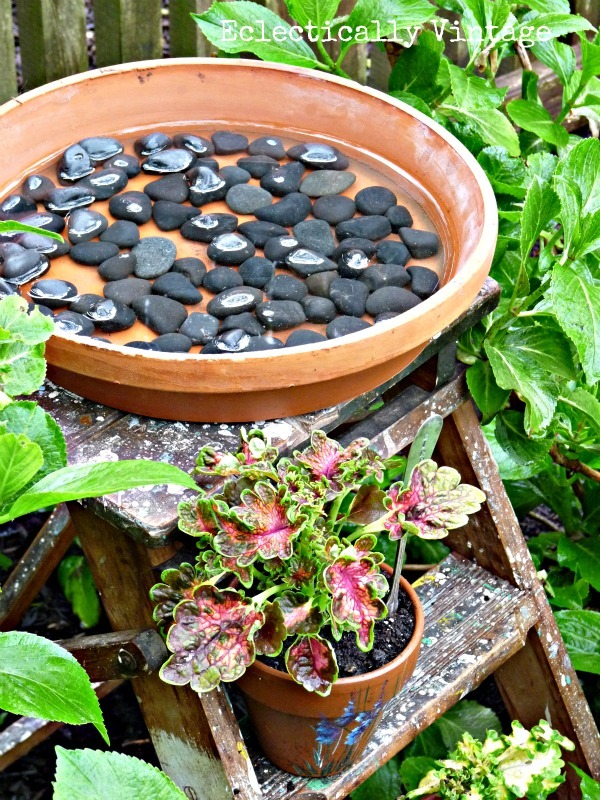 Fill a terra cotta saucer with a few rocks – don’t want those birds doing the backstroke. Oh sorry, that’s a talk should have with your mother. 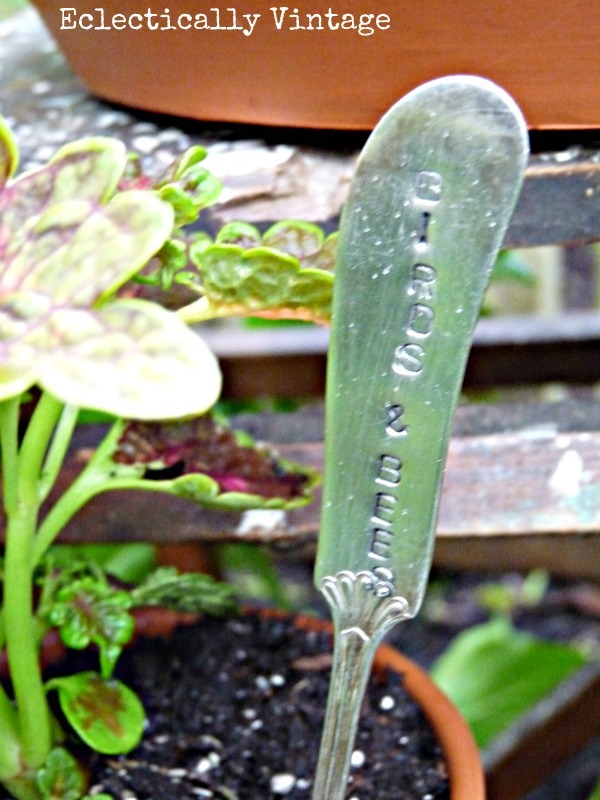 I stamped this old silver butter knife (check out my Etsy shop if you likey likey). Tucked away between the hydrangeas. Hey, even birds need a little privacy while bathing. 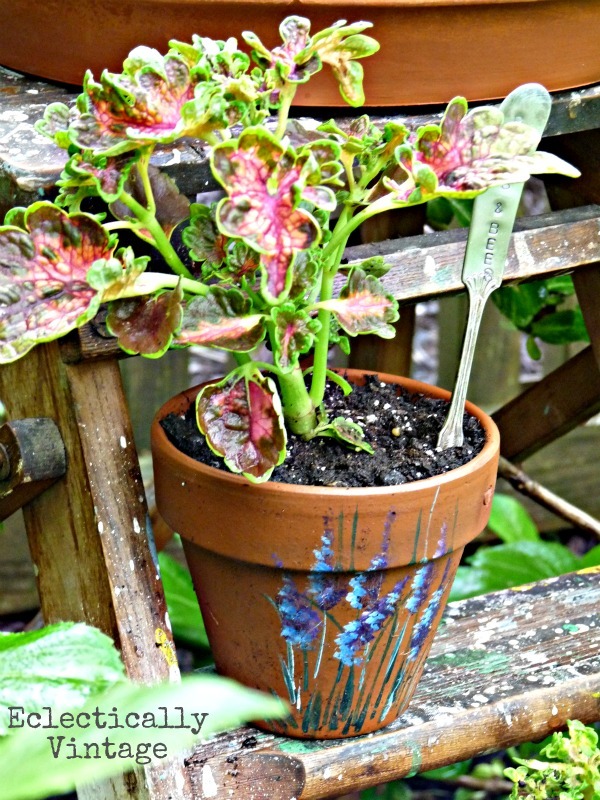 Coleus is one of my favorites – it’s on my front porch too. Shade or sun – it’s not fickle (unlike some people I know). What little feathered friend wouldn’t want to skinny dip here? The best news is now my Ladder Christmas Tree has a playmate! « Previous: Can You Hear Me? Can You Hear Me Now? what a great little idea! I love the birds splashing around in our bird baths. see you on the 29th! That is adorable Kelly. I love the little step ladder, the size is perfect. Pretty pots too. What a sweet little treat for the birds tucked away in your garden! On another note, I didn’t know you had an etsy shop or that you stamped! On my way over to check it out! The above link directs you to a page to register to sell on etsy, not your shop. Thanks for the heads up – I just changed the link! Once again, such a clever idea. I’m sure the birds and bees will be having a of fun on that stepladder birdbath! I have to PIN you! If I had a yard I would so do this! that is adorable! i want to put a birdbath somewhere in our yard! This is so cute! I love how it’s just tucked away among the greenery. I love your step ladder idea. I’m going to use it! This is the second fabulous step ladder idea I’ve seen today. Now I just need to be on the look out for one (used, of course). What’s the first – I need to see! I LOVE this and have an old step stool in my shed. I’m going to copy it! Right after I pin it! Thanks! I absolutely love the whole look. 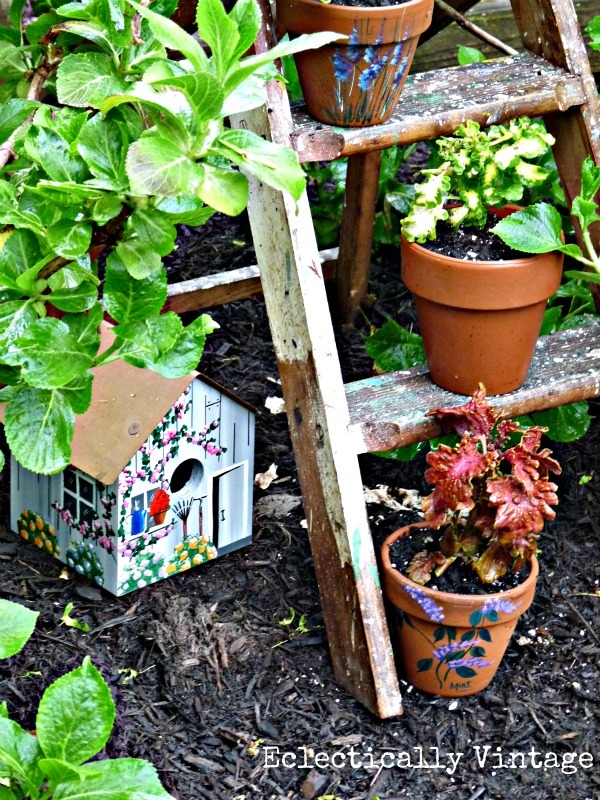 I love the paint on the step ladder, the birdhouse, the fact that you tucked it into the hydrangea bush. Great job Snow White. I am now officially changing my name to Snow White! Now I just need 7 dwarves to listen to my every command! Wow, that looks great! It’s so simple, but gorgeous. I can’t have a bird bath in my back yard…my son would think it was just for him! Maybe the front yard one day. Hmmm, now that’s an idea! 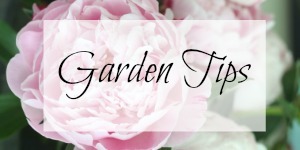 Put the kids in the birdbath – would save me a lot of cleaning of the bathtub! I never thought to do it on purpose! We may just have to try that this summer, once it stops this snowing once a week business 😉 By the way, I love your automated comment replay notification email! I wish everyone had it. Snowing??!! Hope warm weather comes your way soon! And this comment notification rocks! That is just so cute! How did you ever think of using a step ladder? It all looks perfect together!! You and all of your creativity with ladders. Luckily you don’t also have a thing for black cats. 😉 I love this look so much I’m pinning it!! Kelly this is really cute. I love how it looks like it has been there for some time and really flows with the landscape =) Great addition to the garden! It will be even better when those hydrangeas bloom! Your favorite color too! That’s so cute! What a fun little spot! I need to set up a bird bath. We’ve been getting tons of birds lately. Thanks – get those birds to stop by for a visit! Okay–I have just two things to say…(1) this is cute. I am going to try to pin it. (2) I should have that talk with my mother, but seeing as I am 52 years old, she may find it awkward. I’m still waiting for “the talk”! I have so many unanswered questions! This is so sweet! I love your creativity. Thanks Miriam – the birds are happy!! Thanks Miriam – love linking up to HomeTalk – everyone leaves such great comments! I’m in ladder love – please tell me about the birds and bees! And there are dwarfs involved, too – My head is spinning. I am visiting as many of my followers tonight to make a personal contact to see what they are up to – I see you are busy building stairways to heaven! I just wanted to let you know I appreciate you following my blog. Have a great weekend, Snow White! Ok, you may need to sit down for this little talk. There are birds and there are bees … sorry, don’t want to shock you with the details – especially when those 7 little dwarves enter the picture – it gets a little inappropriate! Came back to tell you I featured you today, and your stepladder has been verrrry popular on Pinterest. : ) Thanks again for the inspiration! Thanks for featuring and pinning! The birds are loving their new digs – thanks for loving my stamped silver too (they are fun to make)! Love it! I must be part of the night crew~just saw it on FB. You’re so creative and so sweet to the birds! The birds are my new BFF’s!! So cute!! I’ve always wanted a bird bath in the backyard… now I know even i can afford one! 🙂 thanks for the great inspiration! You go Leanne – the birds need you! Kelly, Love the use of the ladder both here and in your Christmas Tree post. I am in the middle of a series on ladders but it all started with a ladder I made from tree saplings – not a found ladder. If you are interested in ladders in décor check at this project here. and the series on other uses here. Visiting from A2D. Thanks so much for sharing this Donna! The clay pot is actually the saucer to put under the pot – hope you find one! Did you seal the terra cotta pot? If not how often do you have to refill it? I love the step ladder idea! I did not seal it – but may because the water evaporates pretty quickly. I just refilled it – but to the rim – today. Charming ~ I love it! Very Niffty -thriffty creation! Im so inspired by your creativety! Your pics are beeeee-utiful too! stop over and see my blooms and handmade bird feeder/bath and let me know what cha think:) thanks. Thanks so much – getting a show from the birds is fun too! Super cute and I love the painted pots too!! The birds like it too! Sounds like an Irish Spring commercial, lol! Have a great day Kelly! Ah, Irish Spring – that’s what I used as a kid! Sweet garden! I love the addition of the little ladder! Thanks – I love it almost as much as the birds do! I love this stepladder birdbath!!!! So creative and fun! Your charming stepladder looks perfect in your garden. Love it! The birds seem to be liking their new digs too! Ladders are the new black! Love them anytime, anywhere, anyway! I don’t know why I EVER throw anything away. As soon as I do, someone (like you) comes up with a great idea for it. 🙂 Love this, but then, I’m partial to birds. This is clever. Now I’ll have to track down another old step ladder. Following you. Hope you’ll follow me back? I hear you – I part with stuff (after years of hoarding) and the next day I need it! Why oh why does this happen? But we gotta get rid of the old to bring in more old stuff!! I have a vintage step ladder and NOW I know what to do with it. I join COPY CAT CHALLENGE each month and would love to copy cat your ladder. May I use your photo ? Thanks and now, I am about to be your newest follower. Pls. stop by when you have time. But of course – feel free to use one pic with a link back! Good luck and can’t wait to see your copy. Love this! Very pretty & creative! What a beautiful spot you’ve created! Perfect for the birds and bees to relax and unwind! Love coleus – have it on my front porch too. So beautiful! You are so talented! Have a great end to your weekend! Thanks Trish – you’re making me blush!! Another hit! Great way to make a bird bath. That silverware marker is gorgeous, too. I enjoy every project you undertake — Love your creativity!! Thanks so much for linking up at the Wildly Original Round Up linky party! 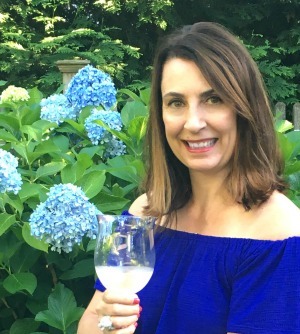 Thanks Christina – so much fun linking to your parties! The birds are so lucky, I love this idea! I’ll be featuring it tomorrow. Thanks Kristin – the birds and I are thrilled! Very cute idea! 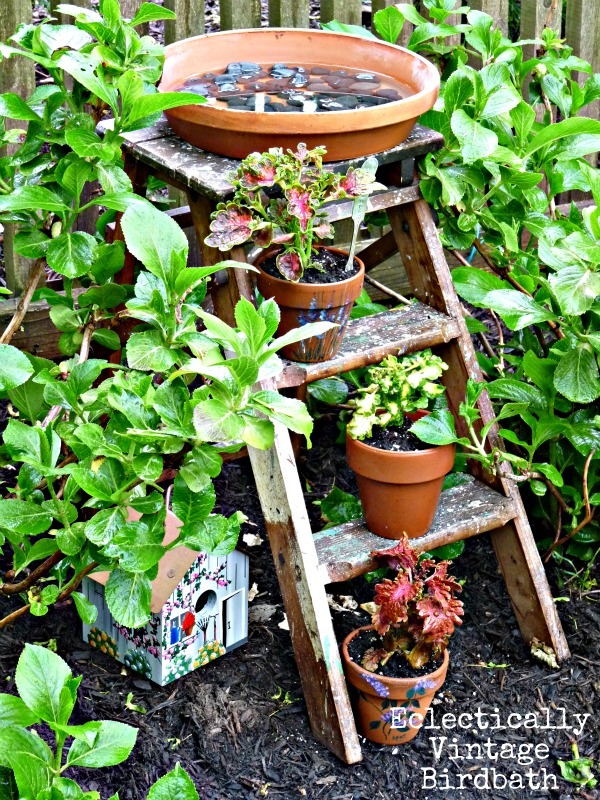 I have an old step ladder like that – it might just get a new home outside! Love your project! 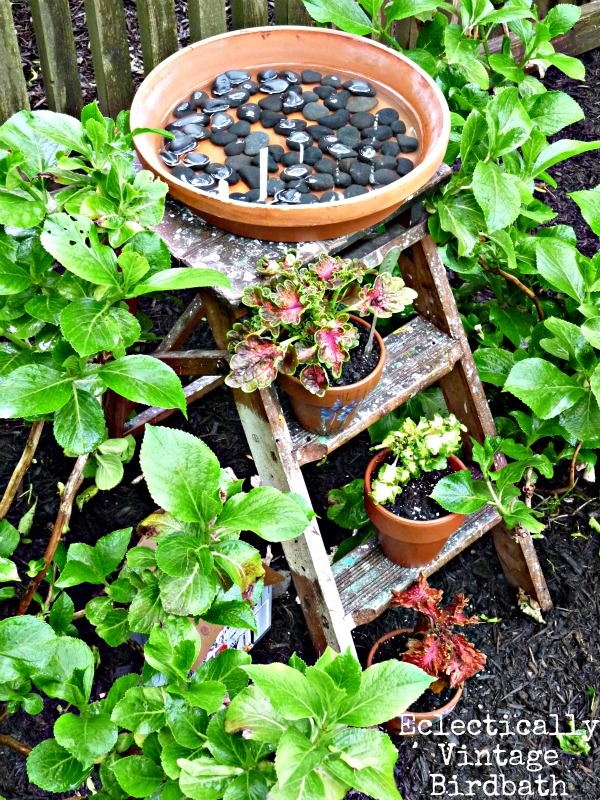 I never thought of using a step ladder for a bird bath great idea! I have a little stepladder that I painted bright blue and use it in the garden to display pots but your idea takes it to the next level! Love the chippy weathered look of the ladder. Love that you combined simple elements…all for the little birds. They should give you a ring of flowers to wear. I pinned this picture & it has been repinned 218 times! I don’t have a step ladder like this so I thought I would look for one at an estate sale to get one with a nice weathered look to it. Well, I found one in someone’s trash when I was walking this evening. I’ll have a nice bird bath by this weekend. Thanks for a great idea. It was fate – you running into that step ladder!! Your birds will be the happiest ones on the block! Just happened to stumble upon your blog this morning and like what I have seen. 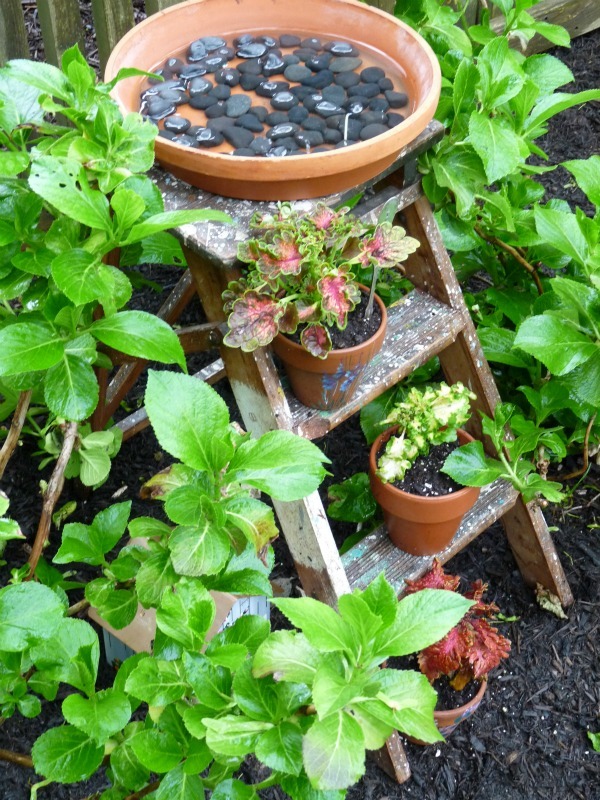 Very Clever birdbath idea. Get some Thompson’s Water sealer; spray can for small projects, and spray your terra cotta saucer and even the pots inside and out; let set for a few hours until completely dry and that will keep the water fram soaking through the terra cotta. Also works on cement birdbaths as well. Once dry, the water should just ‘bead up’ and not soak through. The water sealant also helps from cracking in cold temperatures. For larger projects buy the Thompson’s in gallon can and use in clean, unused hand sprayer. Hi Kelly! Love the look, love the ladder, love the stamped knife! This is so awesome! I had the top of birdbath that was left here when we moved here. took it and sat on top of a flower pot that matched the bowl of the birdbath. Put a few heavy stones in it then sat the bowl on top. that is my bird bath . Remake or reuse what you have before you buy new. No indeed we can’t have the birdies doing the backstroke! Great idea!